Mobile Coupons are easy to create just by using the Coupon Feature in the Profit Pal Mobile Invoicing App. You’ll use one of the provided Templates to create your very own coupons like those above, to send to your customers. You’ll love! this is a new feature in the app! Now you can use one of the new templates in the Coupon Tab in the app. And when you click on the coupon tab you’ll see three different coupon formats to choose from. Click on the one that appears closest to what you would like your coupon to look like. 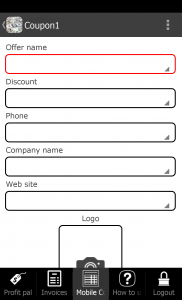 Just select the coupon template that you like, and a screen will open that has boxes, these boxes are labeled and you just fill in the required information. Information like the Name of your special offer, the discount you’re offering your customers, your business information, and how long the offer is good for. Once that’s done, you simply click the Calculate button at the top of the screen and your coupon is made. Then at the bottom of the screen, you’ll see a Send to’ box, that’s where you enter the email address of the customer or multiple customers if you select them from your list and send them the coupon. If you have previously sent them an Invoice then when you hit the + symbol that will open the jobs file, there you can select one customer, or all of your customers to send to. That’s your choice! 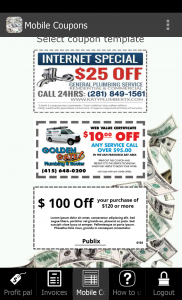 Once you hit the Send button the coupons will be on there way to your business customers. There’s no better way to stay in touch with your customers and ensure a continued relationship with them. If you did a great job for them in the past I am sure they will enjoy getting a Discount Coupon from you. This app could help you to earn much more, and greatly improve your business’s numbers. We’re always thinking of you! And how we can help your business needs. And this one is just too handy, no one in their right mind will pass up a discount for work they’ll need anyhow! So why am I suggesting you get this app? There’s a simple answer, “because we made it for you, and your business to succeed.” It’s really that simple no need to elaborate anymore. Get the Profit Pal Mobile Invoicing App today and send as many coupons as you like, you can attain more business.